The “Hitman Plus” has all the great features of the original “Hitman” but is upgradeable to Stage Six capability. The “Plus” comes standard with four horsepower settings (50, 100, 150, 200) and is upgradeable to 300 HP with the addition of a larger N20 solenoid and jets. If you have plans for the future, but are still on a tight budget, the “Hitman Plus” is the system for you. 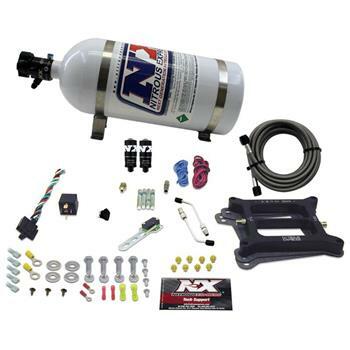 The Phase 3 series nitrous plates are the “Next Generation” in nitrous performance and reliability. This new innovation in nitrous plates provides superior distribution and outstanding atomization. With no spray bars to sag, split, block airfl ow, or damage this is truly the “Next Generation” in nitrous plate technology. Race fuel required for all settings over 150hp.